Forbes calls it "The Hidden Gem of the Caribbean," Caribbean Journal has labeled it one of the region's best, and Robb Report refers to its first hole as "The Caribbean's answer to the 18th at Pebble Beach." Which golf course am I referring to? None other than the PGA-level and Greg Norman designed CuisinArt Golf Club. 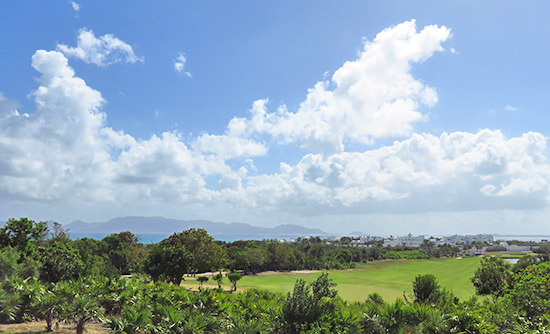 7,000+ yards of 18 manicured holes stretch along the south shore of Anguilla, gazing out to vistas of the Caribbean Sea and St. Martin's majestic mountains. Formerly owned by Temenos, the course fell on hard times when that development went under in 2008. 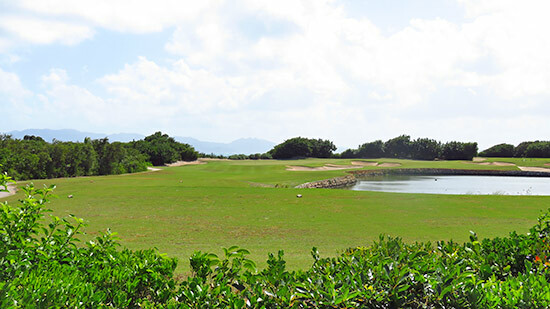 CuisinArt took the course over in 2013, restoring the course's well-deserved high ranking status. 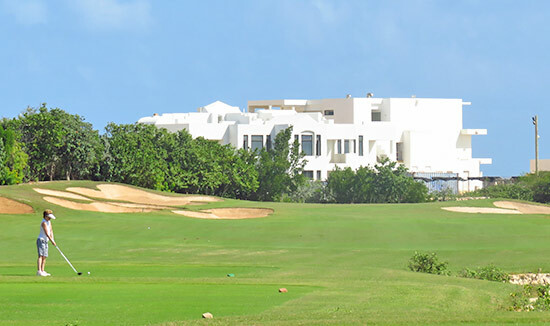 A crew of dedicated landscapers diligently maintain the greens, fairways and tees (no easy task in Anguilla, where grass is extremely difficult to nurture and sustain). A team of engineers water this desert-island course through its desalination plant. And everything is powered via CuisinArt's solar energy plant. 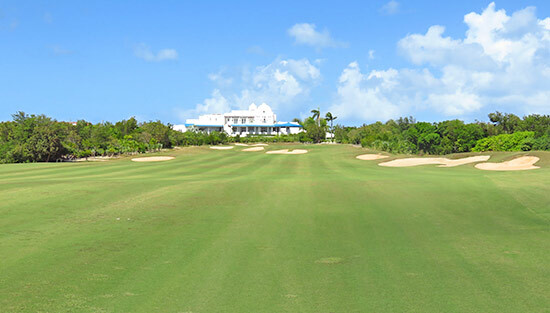 If Anguilla is Tranquility Wrapped in Blue, CuisinArt Golf Club is an oasis of green wrapped by desert. 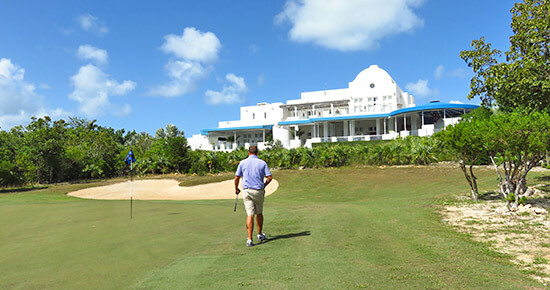 Anguilla golf is at the top of its game in more ways than beauty and challenge. There are few places in the world with a more predictable climate. Anguilla is blessed with an average temperature of 80°F, rarely going above 90°F in the summer and below 75°F during the day in the winter. Skies are consistently sunny, with a lower humidity index than mountainous islands. Mix in cooling tradewinds out of the southeast, and playing conditions are the best in the Caribbean. Inside, white walls meet high, white-washed wood ceilings. 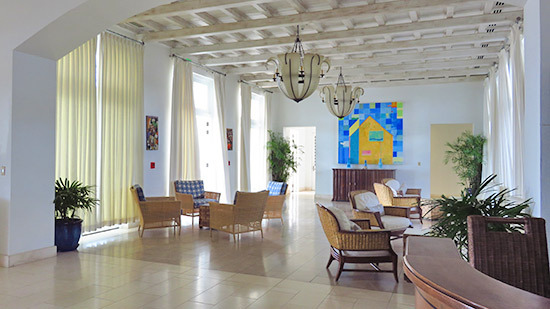 Together with floor-to-ceiling windows, the main reception room is bright and spacious, utterly refreshing. 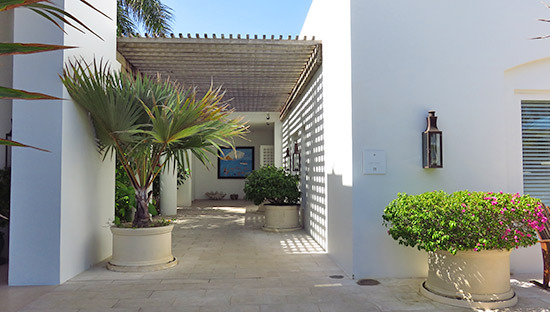 It is also the award site for many tournaments, including the Anguilla Open (the only national open that a near scratch handicap tourist could possibly win). The Golf Channel plays on the flatscreen at the bar across from the main room. 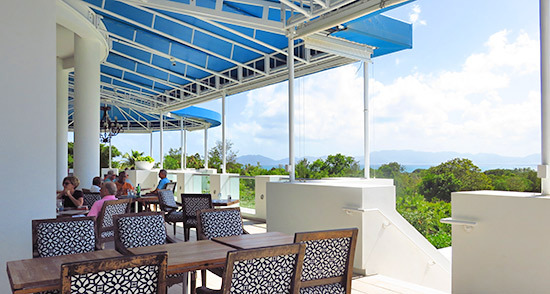 Out on the wide, open terrace, the Clubhouse Grill serves lunch daily. Excellent, classic clubhouse fare makes up the menu. We recommend the club sandwich and pulled pork nachos! 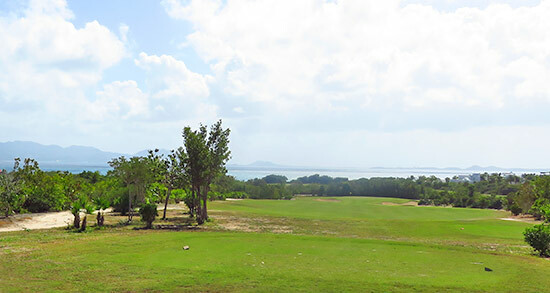 With views of the 18th hole in the foreground, the Caribbean Sea in the background and the mountains of St. Martin in the far distance, the scenery is second to none. 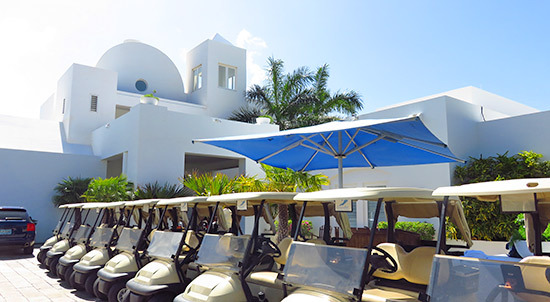 As gentle tradewinds cool the terrace, it is the perfect spot for post-golf meal, beer and "coulda-woulda-shoulda" rehashing-of-the-round conversation. 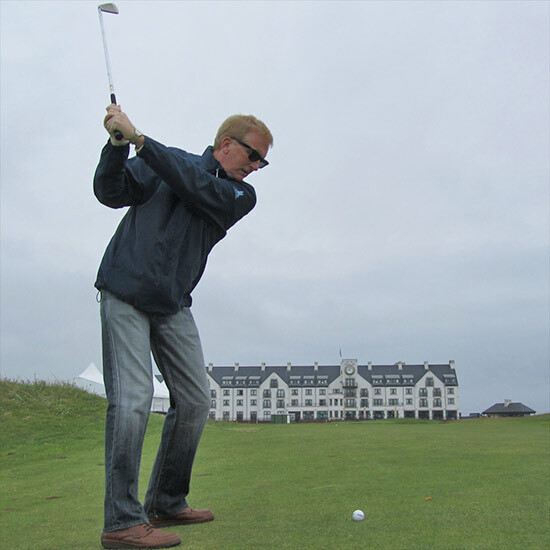 It takes a top-notch golf pro to head up a world-class golf course. Meet Scott DeLong, a PGA Class "A" Certified Professional and Impact Zone Golf Certified Instructor. Scott brings tremendous experience to Anguilla. Before arriving on-island, he was Head Professional at the prestigious and exclusive Deering Bay Yacht and Country Club in Coral Gables. I am not much of a golfer, and certainly nowhere near Scott's level (who was winning tournaments by his early teenage years! ), but my Dad had me swinging a golf club at 10 years of age. An avid golfer himself, he would research golf all day and play until sundown. Absorbed in the mechanics of the golf swing, he also trained a touring pro in Quebec. Together, we've walked and played courses in Canada, Cape Cod and Scotland. Curious about how CuisinArt Golf Club measures up, and with my Dad off-island, Scott was the man to take me around the course. We met at the Pro Shop. 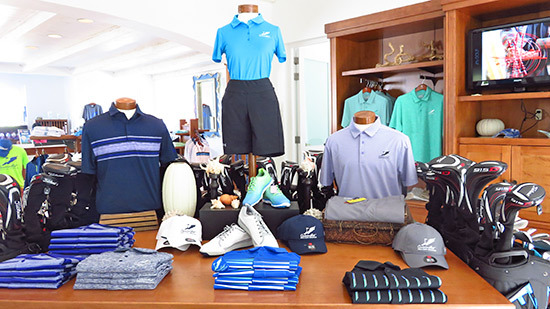 All of the golf attire and equipment you need can be found in the shop. Bring home your choice of golfing souvenir from a wide variety of CuisinArt Golf Club polos and zip-ups. 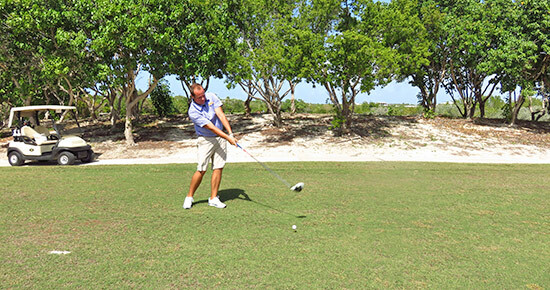 The "Loose Gear" polos, made by Under Armour, are especially breathable and light, perfect for playing in Anguilla or on warm summer days back home. Scott scooped up his clubs and we were on our way to see some of Scott's favorite holes, including the course's most challenging. This is a course where you constantly adjust to diversity. Holes play towards the sea, facing the clubhouse, inland (sheltered from the breeze), along the ocean, and most exciting (and frustrating) of all? The holes that play directly into the wind. The map below shows the layout of CuisinArt's golf course. Click "Satellite" to better see the terrain and landscape. Scott set a high bar with his first stop, the first hole. A tremendous start to a round of golf, the panoramas are breathtaking. 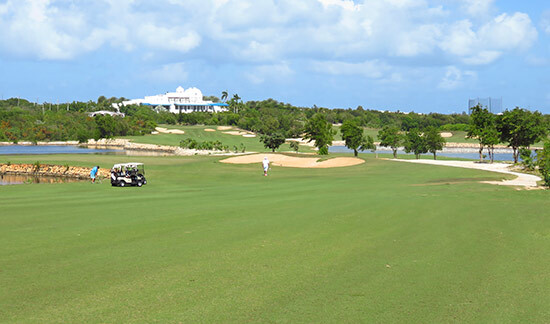 The crisp, green fairway stretches for as far as the eye can see before meeting the Caribbean Sea and St. Martin. A par 4, it's a straightforward hole measuring 345 yards from the men's tees and 291 yards from the women's (or, if you're brave, 384 from the tips). It's set back from the water and the wind line. The fairway gradually slopes down towards the green. Even I was able to drive the ball 150 yards down the middle of the fairway. The green itself has two levels and backs into trees. "The only thing you don't want to do here is overshoot the green and wind up in the trees, or come up short in the bunkers," Scott explained. The perfect warm up hole, you have a good chance of feeling great as you move onto our next stop. The second hole plays a little differently. The teeing ground follows the pond, which is always to your right. The typical tradewinds push everything to the right here, creating a wide variety of possible shots, depending upon how good (or bad) your tee shot is. "You have to try to allow the ball to ride the wind, which is tricky as the easterly tradewinds tend to carry your ball further than expected. Too much carries you into the bunkers, or worse the pond." A stunning and inviting window to the beach! "I guess I shouldn't recommend folks to bring their bathing suits on a round of golf, eh?" I joked. As we hopped back in the cart, I asked, "Which hole is your nemesis, the one that drives you crazy?" Scott shook his head and laughed. "Great question," he exclaimed. We were on our way to the 16th hole. "The 16th hole is one of the toughest on the course," Scott said with a sigh, having lost too many balls to the pond that flanks its right. Off the tee, you play straight into the strong tradewinds blowing in from the east. "On a windy day, you have your work cut out for you," Scott warned light-heartedly. "Not only that, but you have the pond to your right, dense woods to your left, and tight, deep bunkers around the green, three being on the left," he continued. "You don't want to hook it left. If it lands in those trees, your ball is gone. Your only choice is to hit the ball straight, low and into the wind with as much force as you can control. If it's traveled low and far, it won't roll into the pond. But, if your ball flutters up and into the wind, it may very well end up wet." Pressure on, it was time to put Scott to the test! Pressure off, we were on our way to Scott's personal favorite, the 18th. On the way, it was hard not to notice how spectacular and well-kept the grounds are. Smooth, with that signature fresh-cut scent in the air, the course is in immaculate shape. One would never guess the battle with long droughts, hot sun and salt air. Its quality is a true testament to technology and the dedicated team of greenskeepers. The bright, white clubhouse in the distance, a long stretch of pristine fairway ahead, and with the wind at your back, it is indeed a beauty. A par 4 that runs all uphill, approximately 430 yards from the tips (388 from the men's and 330 from the women's), the 18th is a spectacular finishing hole. 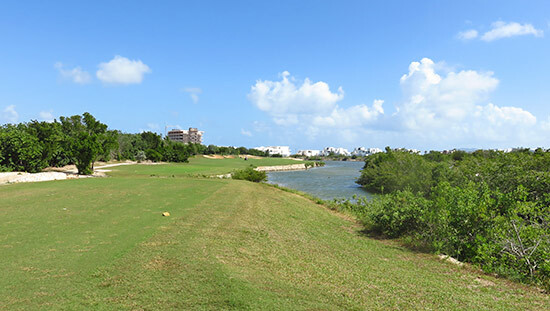 "Some folks find the views of St. Martin and the Caribbean Sea more appealing, but this is my personal favorite view and the hole is a joy to play..."
"... as long as you can avoid the bunkers that guard the front of the hole!" Scott smiled. Scott's third shot, a chip off of a good miss, ended close enough for a tap-in par. No wonder it's Scott's favorite hole! 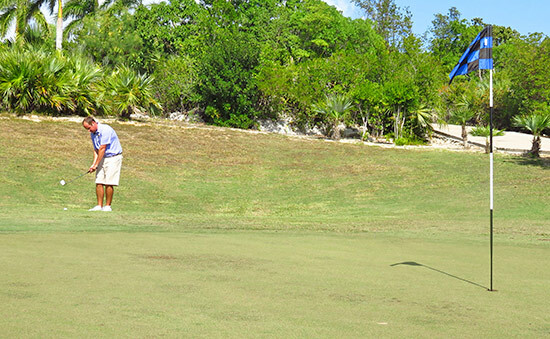 "Adapt or die" is the order of the day at CuisinArt Golf Club. 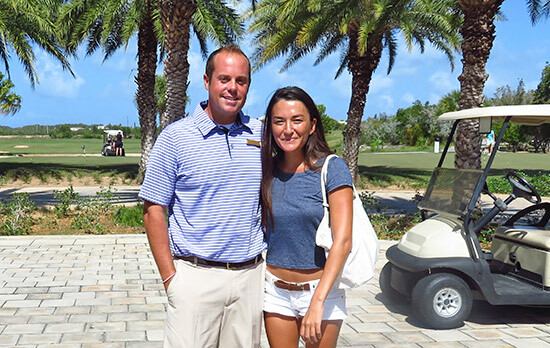 We will be adding more of Scott's insights on CuisinArt Golf Club. Stayed tuned to Anguilla Beach Lovers Newsletter.